Standing as high as the deck of the Golden Gate bridge...90 ft Higher that the Statue of Liberty...45ft. higher than Niagra Falls... this kingsize shovelchews into the earth and with each bite picks up 200 tons of rock and dirt. Its helpmate stands nearby, A machine that drilla a 15-in. diameter hole 150 ft. deep through solid rock in only 15 minutes. World's largest shovel removes 36 million cu yards of dirt a year, uncovers 14,000 tons of coal daily. Sound like something from science fiction? 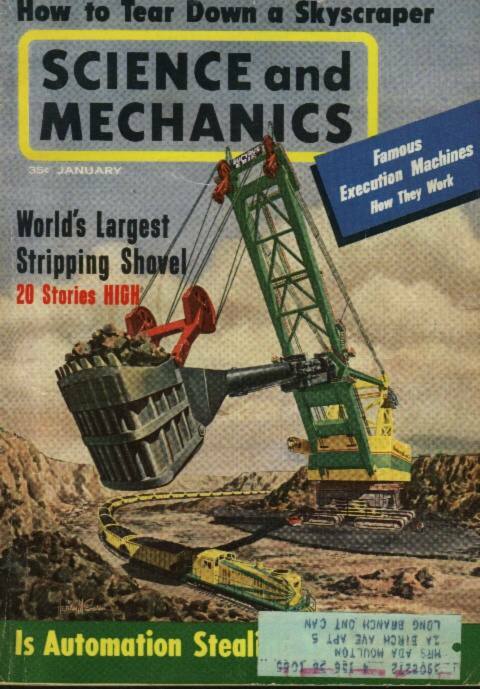 In western Kentucy at the Sinclair Mine of Peabody Coal Co., the mammoth stripping shovel, built by Bucyrus-Erie Co.,is proving 24 hours a day, 7 days a week, that it is not science fiction. 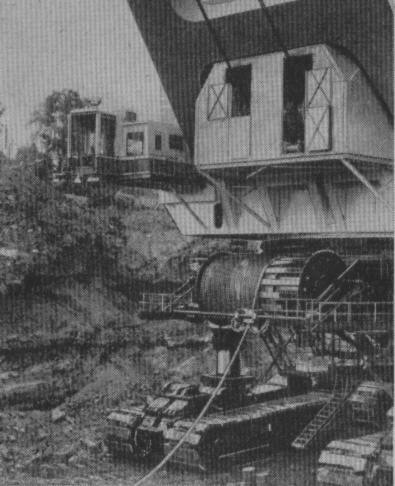 Biting off roomfuls of rock and dirt to uncover seams of coal, the Bucyrus-Erie shovel is the largest self powered mobile land vehicle ever built. 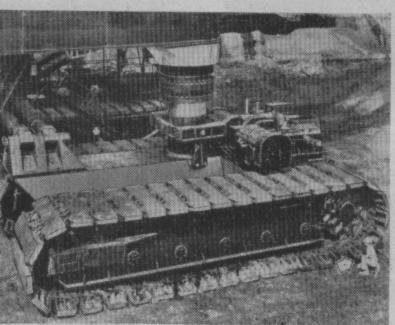 Manufactured in South Milwaukee, Wisconsin, the components were shipped in 300 railroad cars to the mine stie in western Kentucky, where it required 11 months to erect. the sections were built like battle-ships, with on of 17 sections, as an example, weighing almost 50 tons. The sections were fabricated individually, then carefully machined to fit into a single structural unit. The sheer size of the new shovel, which is more than 3 times the size of any other shovel in operation, staggers the viewer and underscores the reason for its being built. Coal reserves in this western Kentucky area were deeply buried. 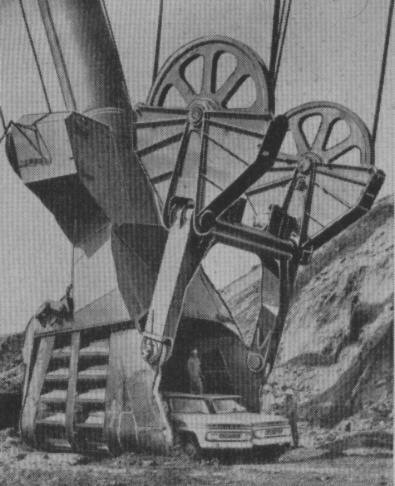 Until the machine was concieved, it was not practical to dig out all of the material necessary to get at the coal. To work with the new shovel, Peabody purchased the world's two largest rotary blast hole drills from Bucyrus-Erie. With one-man control, these machines drill 15 in. holes for explosive charges that blast the rock and dirt loose for the shovel to remove. The giant stripping shovel towers as high as a 20-story building, and can remove more that 100,000 cu. yds. of material and uncover 14,000 tons of coal each day, thus fulfilling its purpose by opening up coal reserves which have been economically unfeasible in the past. In a single month the shovel can remove enough material to fill a train streching from Pittsburgh to Chicago. Sitting at his air-conditioned control booth five stories up, the operator controls all movements of the monstrous shovel with just two hand levers and two pedals. He is carried to his workshop by a special electric elevator located in the center of the machine. He can accelerate each 200 ton load from 0 to 25 mph in 8 seconds, and can decelerate from top speed to a full stop in 4 seconds. The King_size shovel, which can outreach an average city block, is powered by electric motors-- 52 in all -- ranging from 1/4 to 3000 Hp. Power requirements of the monster are equal to that of a city of 15,000 people. A Half million cubic feet of air per minute is required for motor cooling alone... matching the air output of 500 12-in. house-hold fans. one man operates the mammoth machine with two hand levers and two pedals, accelerating a dipper load of almost 200 tons from 0 to 25 mph in 8 seconds. The dipper, whose cubic capacity is bigger than a two car garage, has a cutting edge which required the largest foundry pour in the Bucyrus_Erie Company's history. The lip alone is a 20 ton 16 ft. wide casting . . .a one piece casting of a special Bucyrus-Erie alloy. The massive dipper can uncover enough coal to heat 7500 average homes one month or 1500 homes for an entire heating season. Wider than an eight lane highway, the excavating machine moves on eight crawler treads, each over eight feet high. The crawlers have almost 300 individual pads, with each pad weighing nearly two tons. The entire machine is supported on four sets of dual crawlers which are automatically leveled and equalized through four hydraulic jacks which weigh 2500 tons and use 4500 gallons of hydraulic fluid. Two years were needed to design, manufacture, and erect this gigantic machine. 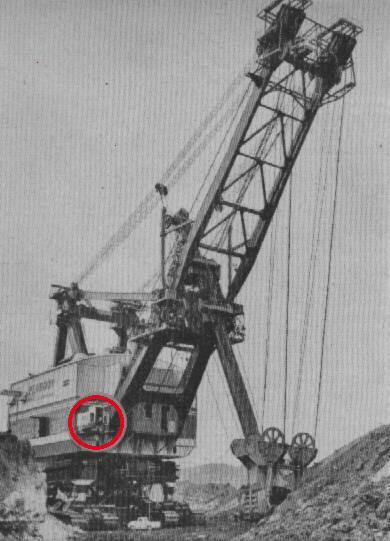 As you turn up the thermostat in your home this winter, think about the Bucyrus-Erie coal stripping shovel as it swings through its 420-ft. arc, making a complete cycle in one minute, picking up almost 200 tons of earth...every minute, 24 hours a day, 7 days a week. It moves on eight crawler treads, each over eight feet high. The crawlers have 296 pads, each pad is an alloy steel casting which weighs almost two tons. Even the link pins weigh more than 100 pounds apiece.